Nintendo’s vaunted internal game development groups are merging as part of a structural changes at the house of Mario, changes that we’d be lying if we said we fully understood. But, hey, who doesn’t like staring at a revised org chart and trying to deduce gaming’s future in the process? It’s hard to tell whether Miyamoto’s job will actually be changing or whether his vague new title reflects a more distanced, less hands-on connection between him and Nintendo’s top studios. For a long time, Miyamoto has worked above many of Nintendo’s top development projects, diving in when need be, but long removed from running the day-to-day creation of a given game himself. It is at least clear that Miyamoto will no longer have the title of General Manager, Entertainment Analysis & Development Division (EAD). In fact, no one will have that title any more, and it appears that EAD—long regarded as the premiere group of studios at the company, the ones behind the Marios and Zeldas and other top titles—itself is changing at Nintendo. The apparent elevation of Takahashi doesn’t surprise me. For many years, I’ve interviewed Miyamoto at the big annual E3 gaming trade shows, and I took it as a signal when I arrived at my 2014 Miyamoto interview to find myself in a room with Miyamoto and the younger Takahashi. (That’s them in the picture atop this post, Takahashi on the left, Miyamoto on the right.) As I understood it at the time, Takahashi and Miyamoto were on the same level, each overseeing different aspects of game development for Nintendo. E3 2014 was a big show for Super Smash Bros., and that franchise was made through Takahashi’s SPD side of things in partnership with outside studios. Miyamoto’s teams were the ones that made Marios and Zeldas. Takahashi’s team seemed to be in charge of Amiibo and Metroid and worked more with partner studios such as Intelligent Systems on the Fire Emblem franchise. (Wikipedia has useful listings of EAD games and SPD games, though it’s Wikipedia, so who knows how perfect the lists are.). 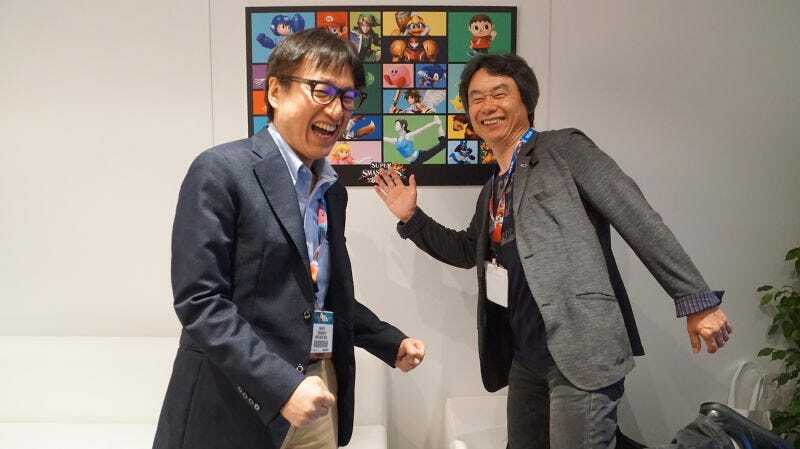 Miyamoto seems perpetually youthful and energetic, but the man has to wind it down at some point and rumors of pending retirement have popped up in recent years. Who knows if these changes mean his retirement is close, but it is clear that Takahashi is getting more authority. It struck me back in 2014 that Takahashi was Miyamoto’s likely successor. And maybe it says something about generational differences or tastes that when I’d asked both men about Minecraft in 2014, Miyamoto deferred to Takahashi. It’s any outsider’s guess what the consolidation of EAD and SPD under one person means. Reinvention? Or simply rebranding? Impossible to say. Here’s a little more to chew on. Yoshiaki Koizumi, the man who was running EAD Tokyo, is now a deputy general manager at EPD. Katsuya Eguchi, formerly deputy manager at EAD and the father of the Animal Crossing franchise, also gets that new title. This change appears to enshrine Koizumi, whose EAD Tokyo studio has produced some of the fresher games from Nintendo over the last decade, including the Super Mario Galaxy and the Super Mario 3D Land/World games, as a top internal guy. Nintendo has actually given a heap of title changes to its top people. You can scroll through them here and try to deduce the future of all of gaming in the process. And note two other structural changes at Nintendo in addition to the merging of EAD and SPD. What could they mean? We will integrate personnel responsible for the technology development essential for Nintendo’s hardware formation such as hardware, OS, development environment and network, and in order to create a structure in which we can more broadly and efficiently conduct technology development necessary for new products and services, the Integrated Research & Development Division and the System Development Division will be consolidated into the newly established Platform Technology Development Division. Some Nintendo Kremlinologists will be able to read through this and come out of it concluding the exact system specs for the company’s new NX platform. Others will just see a lot of corporate shuffling. If anyone can read through, though, and tell us what any of this means about the future of the Rusty’s Real Deal Baseball and Tingle franchises, give a holler.